Nomura was once considering turning it into a first-person game. Famitsu this week has new details on Final Fantasy XV. The details ranges from staff information to expanded character descriptions to random development tidbits from a lengthy interview with director Tetsuya Nomura. Noctis Lucis Caelum (CV: Tatsuhisa Suzuki) – The Crown Prince of the Lucis kingdom. Due to an accident during his childhood, he can see the “light” from the heavens which foreshadows a person’s death. (Basically, he has eyes that let him foresee a person’s death. That imminent death is symbolized by a “light”—cue “eyes that can see the light of expiring souls” in the trailer.) Noctis dislikes the strict and rigid rules of the kingdom and acts as he pleases, thus causing trouble for his peers. He is a man of great confidence, but the most important thing about him is that he protects his friends. Gladiolus Amicitia (CV: Kenta Miyake) – The eldest child of the Amicitia house. He’s the “shield” of the royal family and is sworn to protect them for generations. He has a powerful physique and a “raptores” tattoo on his arm and breast. He raised Noct from his early childhood days and considers him his brother, almost surpassing the relationship of a family. He has a very good relationship with the royal family and is their sworn friend. He wears but a jacket over his bare chest and is a tough guy who shaves one side of his head. Ignis Scientia (CV: Mamoru Miyano) – A young man who is a close friend of Noctis since early childhood. He is composed and serious, and received a special education for gifted children in order to work as a staff officer for Noctis. He acts as the understanding consultant for the clumsy Noctis, whom he follows, and wears glasses with swept back hair. Prompto Argentum (CV: Tetsuya Kakihara) – A woman-chasing mood maker who has been quite different from Noctis and friends since their childhood days. He was their bad companion. He minds his childhood friends and has a different social status. In that extent, it seems like he wants to be useful to his friends. He is a bit shorter than Noctis and wears a sleeveless shirt and has messy blond hair. Cor Leonis (CV: Hiroki Touchi) – A stubborn military man who has sworn his loyalty to the his country and Noctis’ father, King Regis. He is the commanding officer of the elite imperial guards. Known as the “Immortal Shogun,” he is extremely powerful and one of the top three soldiers in the Lucis kingdom. He sticks strictly to Noctis and friends, whose company he isn’t much fond of, but travels with them for the sake of watching them. He is a middle-aged, short-haired man with a grim face. Square Enix suggested the change from Final Fantasy Versus XIII to Final Fantasy XV two years after the game’s announcement in 2006. It was possible the game would still retain its original name, but the ultimate decision to change it to Final Fantasy XV was decided when Final Fantasy Agito XIII was renamed Final Fantasy Type-0. Sometimes, the timing for such decisions is difficult, but it was publicized after all of the departments settled on it. The decision to move to PlayStation 4 and Xbox One was made two years ago. At the time, it was still expected to be a cross-generation title (on PlayStation 3, as well). 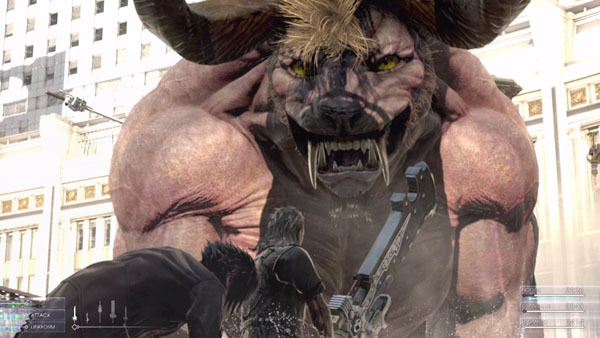 Final Fantasy XV‘s re-announcement was planned for 2012, but was postponed for various reasons. The life span of current generation consoles became a problem. I did a lot of trial and error on current generation consoles, as I wanted to try various things and squeeze out too much from the hardware. That was the inception of switching completely to next-gen, which was suggested by the company. There were a lot of things I wanted to do and present so they became my main concern. I wanted to make everything as seamless as possible, thus it was necessary to put all of the action into the [hardware’s] memory. All of the character data is persistent. As the player fights a vast amount of diverse enemies on a huge map, it puts considerable load on the memory. Thus, I had to make the choice to switch to next-gen at all costs. I wanted to make an action-based Final Fantasy game. I toyed with the idea of switching to a first-person point of view and making Noctis the only playable character, and even getting rid of the UI completely. But that would have eliminated any resemblance it had to a Final Fantasy game. Thanks to next-gen hardware, I could include destruction, warping to high altitudes, and map changing. Final Fantasy XV development is being ported from DirectX 11-based hardware. It’s the reverse of our approach until now, where we target this generation of hardware. There’s no difference in media storage between PlayStation 4 and Xbox One, as they’re both using Blu-ray. The final specs depend on how close the machines can match the “original Final Fantasy XV” developed in DirectX 11. As we are using over-specification hardware to develop Final Fantasy XV, I can’t say how much the final, optimized versions will differ yet. Currently, we aren’t considering a PC version, but it ultimately depends on demand. Right now, it would take a fairly expensive gaming rig to play the game at full specs but we will consider it if demand is high enough. We are developing the game with Luminous Studio and team original sections, and are also using middleware. In the future, there are plans to integrate it into Luminous Studio. Once the game engine was completed, both teams, Final Fantasy XV and the Luminous Engine teams, continued working on the engine while simultaneously developing the game. Luminous Studio features a fully operational camera that’s being optimized [for Final Fantasy XV]. Sometimes, there’s stuff we’re changing, too. It [the camera] is aimed at the people at Visual Works (Square Enix’s CGI production studio). There have been some changes in the staff. Hajime Tabata is the co-director and Takeshi Nozue is the Total Visual Director. Nozue is a member of Visual Works, but we are now developing games together. As he is overseeing the visual production, the difference between real-time scenes and pre-rendered (CGI) movies is almost negligible. “Look Development,” a technique developed and coined by Visual Works, is used in Final Fantasy XV. It is very similar to Agni’s Philosophy in that it allows pre-rendered movies to be produced and dropped into Luminous Studio and played in real-time. Noctis’ level in the E3 2013 trailer is quite high, so he is able to use many weapons and warp freely. Players won’t be able to use all of those skills from the beginning of the game. The starting point is the Kingdom Hearts series’ simple and exhilarating action feeling. It’s not difficult. Most things can be performed intuitively. I am also considering each difficulty level’s specific operation procedures. Companions support the player with co-operative attacks and respond to situations with autonomous actions. The battles will be varied. In Final Fantasy XV, it is possible to free-run towards monsters outside the map, as well as ride on monsters and aim at specific parts of their bodies. There will be flashy situations and boss battles like the Leviathan battle [shown briefly in the trailer], in which it is causing a water tornado and the player is jumping between collapsing buildings. The feeling of speed is important during battle. The player can freely control the character’s movements, but spectators (people watching, not playing) might lose track of what’s going on. I’m having some trouble with the [game’s] motion. It’s simple to make it realistic, but there are still issues occurring. I’m constantly rebalancing the game so it looks realistic and plays well. There are a few more bullets, but they appear to be from last week’s online interview, which is probably best to read in full through here.